Set in this purpose built block, is this well presented two bedroom first floor flat offering views across the Park, over the River Mersey and towards Liverpool; ready to be snapped up as it is being sold with no chain! Located in a convenient area not far from the amenities in Poulton and Liscard including handy shops, frequent bus routes and local schooling. Well placed for the promenade and Seacombe Ferry Terminal, as well as commuter links via the Birkenhead Docks, M53 motorway and Liverpool tunnel. Interior: secure communal entrance with intercom and stairs to all floors, inviting hallway, living area boasting those aforementioned views, kitchen, shower room and two bedrooms with the first benefitting from fitted mirrored wardrobes. Complete with uPVC double glazing and gas central heating. Exterior: communal gardens and external brick built outhouse. Be quick not to miss out viewing this lovely flat; call our office today to get booked in! LIVING AREA 16′ 07″ x 10′ 07″ (5.05m x 3.23m) Boasting lovely views across towards the River Mersey from the uPVC double glazed window at the rear elevation. Dado rail, television point and central heating radiator. Complete with feature fireplace. KITCHEN 9′ 06″ x 9′ 05″ (2.9m x 2.87m) Matching range of base and wall units with contrasting work surfaces over and tiled splash backs. Sink and drainer with mixer tap sitting below the uPVC double glazed window to front elevation. Space for fridge freezer, washing machine and cooker. Central heating radiator and wood effect vinyl flooring. BEDROOM ONE 13′ 02″ x 10′ 07″ (4.01m x 3.23m) Great views again of the River Mersey from the uPVC double glazed window to rear elevation. Telephone point, central heating radiator and full length fitted wardrobes with mirrored sliding doors. 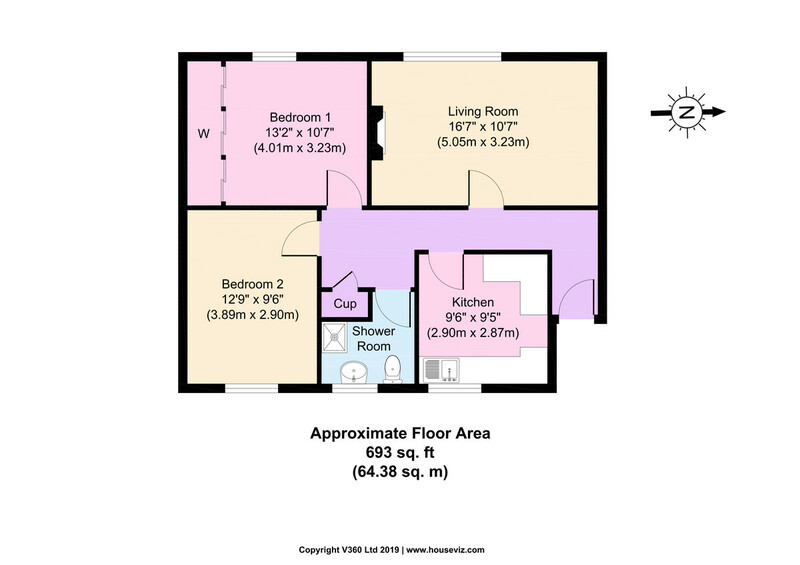 BEDROOM TWO 12′ 09″ x 9′ 06″ (3.89m x 2.9m) uPVC double glazed window to front elevation with central heating radiator and wall mounted combi boiler. SHOWER ROOM uPVC double glazed frosted window to front elevation. Suite comprising corner shower cubicle, low level WC and floating wash basin. Central heating radiator, tiled walls and non-slip flooring. EXTERIOR Communal garden and brick built outhouse for storage. LOCATION North Park Court can be found off Demesne Street accessed via Borough Road East and Church Road approx. 2.3 miles driving distance from our Liscard office.